At our house, we are always looking for a reason to celebrate, and football season brings with it plenty of good excuses to have people over. In Texas, it is almost a given that you will have Queso at your football party, or any party for that matter! It is a statewide obsession! If you have never had the creamy, zesty dip, you should plan to make a batch for your next get-together. The Famous Queso recipe is delicious and couldn't be easier to make! You just need a 10oz can of RO*TEL diced tomatoes and green chilies, 16oz of creamy VELVEETA, and 5 minutes with the microwave. You can make your Queso simple and delicious with the basic two-ingredient combination or you can spice it up by adding ingredients like chorizo or black beans. Want to make your Queso party a huge hit? Have a Queso bar! Let your guest choose what to add to their Queso by having a selection of beans, peppers, diced chicken, avocado (and any other ingredient you think might taste good in Queso) available for them to build their own customized Queso combination. The possibilities are endless because Queso goes with just about anything! Not everyone loves to sit through an entire game of football, but when you bring out the game day snacks like Queso and chips, everyone comes together, even the five-year-old girls! VELVEETA and RO*TEL are a winning combination on game day and right now they want to give you even more opportunities to win, even if your team doesn't! 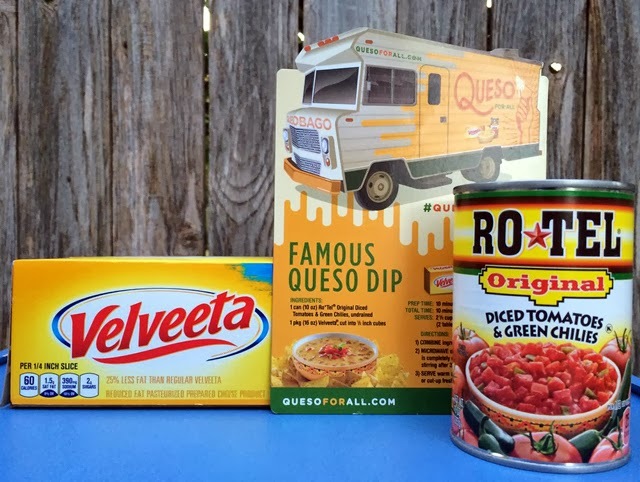 The VELVEETA and RO*TEL Quesobago, loaded with Famous Queso Dip, is making a cross-country tour to college football’s hottest rivalries. You can visit www.quesoforall.com to find the Quesobago tour schedule and for a chance to win a party featuring the Quesobago on football’s biggest game day. While you are there, check out all of the other great Queso recipes! You can also win a $100 Visa gift card here on my blog! Leave a comment letting me know what makes Queso the perfect party dip and you will be entered to win! This sweepstakes runs from 10/21/13 - 11/24/13. Be sure to visit the It Only Takes Two page on BlogHer.com where you can read other bloggers’ reviews and find more chances to win! Disclaimer: I have been selected by ConAgra Foods and Kraft Foods and to be a spokesperson for the RO*TEL and VELVEETA Queso for All campaign. While I have been compensated for my time, my opinions are my own. I love that it's just so easy to make! It's the perfect party dip because it's a crowd pleaser! It is the perfect dip because everyone always loves it! Even the kids! Queso is the perfect party food at my house because it is one food everyone agrees on! we add to this a small philadelphia cream cheese, shredded jack cheese, shredded Colby cheese \. I think it's perfect in part because it leaves the hostess that little bit less stressed (it's so easy!) and because everyone likes it - it's always gone! it's the perfect dip because it's easy to make, inexpensive and most everyone likes it. Queso is the perfect party dip! Quick, and crowd pleasing! It's so easy to make and you can customize it. It's so easy to make and delicious. Its perfect because you can mix it up with different add-ins to suit everyone's taste. 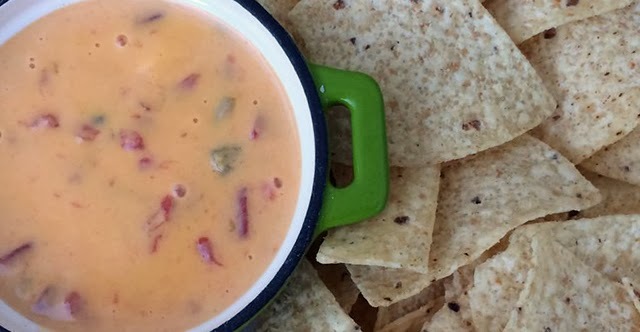 Queso is the perfect party dip because everyone I know loves it. We make this too, but we always add cooked crumbled sausage. Queso is always a huge hit at our house! it's perfect because everyone loves it and its easy to make! It's the perfect dip because it is easy and yummy. Thanks. I like it because you can dip other things besides chips! Its ingredients and the ease to prepare it make for a perfect dip-so sorry, I missed it at the Michigan State v U of M game. Everyone loves queso -- and it's super easy to make! YUMMY! It's fast and easy to make and tastes great with veggies, crackers, or chips. This dip is a hit at all parties. Queso is great for parties because it is flavorful and warm. It's so easy to make and you can change it up to make so many variations. It’s easy and quick to make and tastes wonderful!. I think it started in Houston, Texas. Remember the "LongHorns".. This recipe has been around a long time and I never add a thing to it, except Frito's. it is the perfect party dip because it tastes so good and it is easy to make. Queso is something that everyone loves - so it's always a bit hit! Velveeta and Rotel make such a versatile dip... lots of add-in ingredient options! Queso is perfect because its creamy w/all the melted cheese & goes perfect w/anything to dip! Easy to make. Everyone loves queso dip. The hotter the better. This easy queso makes a great dip with chips, but goes great on tamales. This is the perfect party dip because it is so easy to make and everyone loves a tasty cheese dip!! It's not gameday without queso. It's easy to make and it's something everyone likes so it's the perfect food for a party. Thank you! As a vegetarian, I can always count on it to be friendly to my diet restrictions. It's perfect because it can be made extra spicy! It is the perfect party dip because it can be used to prepare many delicious recipes quickly. The rich filling cheesy deliciousness of Queso makes it the perfect party dip. perfect party dip because it's quick and easy and won't take away from hostess duties and enjoying your company. Love queso because its so simple and delicious. It's perfect because it's warm and cheesy and delicious! Everyone loves queso! Even kids. It's easy too! this recipe looks scrumptious especially for the upcoming holidays. We love this dip - we like to add a can of chili too for a bit of kick!! 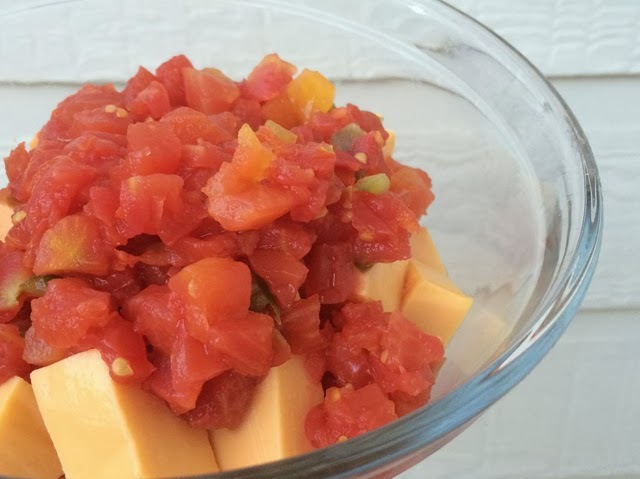 Queso is the perfect party dip because it is versatile to make different kinds for my families tastess by adding ingredients like sausage, strips of colored peppers and black olives. There`s never any leftovers!